If yesterday was a little too masculine for you, then today's couldn't be any more uber feminine. I am a BIG fan of this artist's blog and I "oo" and "aw" at every single post. The downside when comparing is, she is a master with photography and photoshop and my photos just don't hold a candle when held side by side. 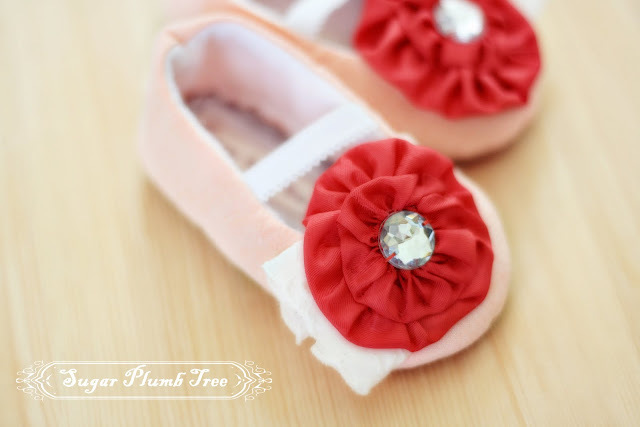 But regardless, it was the colors and sparkle in the photo that inspired these shoes. I had some pretty coral vintage cotton fabric that wasn't pink and wasn't orange but somewhere in between in a beautiful coral. I made a couple of red satin yoyos with sparkling jewel center that reminded me of the sparkle coming off the wheels of the bicycle. A little bit of eyelet lace peeking out just adds some extra sweetness like her white dress and blowing scarf in the photo. And here you are. 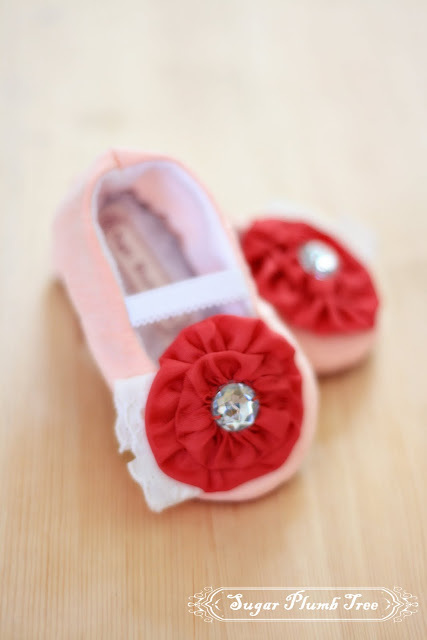 Sweet little uber girly shoes in size 6 months (4.25 inches long or size 2). They are available in the paypal link below on a first come basis. $35 for the pair with $2 shipping. That's also it for the weekend and I'll pick this series back up on Monday.